Inspired by the classic elegance of antique European whole-cloth quilts, Adelia Creme Collection features meticulously hand-stitched diamond quilting covering the front and back. 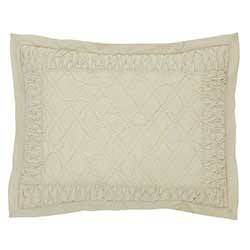 The hand-pleated border on all sides is finished with an additional vintage-style flat flange. 100% cotton. By VHC Brands (formerly Victorian Heart). Adelia Creme King Bed Skirt, by VHC Brands. Dress up your bed with our elegantly hand-pleated Adelia Skirt. Made of soft 100% cotton. Adelia Creme King Quilt, by VHC Brands. Inspired by the classic elegance of antique European whole-cloth quilts, Adelia Creme King Quilt feature meticulously hand-stitched diamond quilting covering the front and back. Adelia Creme Quilted Luxury Sham, by VHC Brands. An elegant hand-pleated border surrounds the diamond-quilting detail in the center of the Adelia Creme Luxury Sham. Flat flange on all sides completes the decorator look. 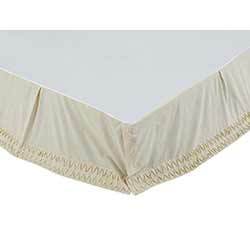 Adelia Creme Queen Bed Skirt, by VHC Brands. Dress up your bed with our elegantly hand-pleated Adelia Skirt. Made of soft 100% cotton. Adelia Creme Queen Quilt, by VHC Brands. Inspired by the classic elegance of antique European whole-cloth quilts, Adelia Creme Queen Quilt feature meticulously hand-stitched diamond quilting covering the front and back. 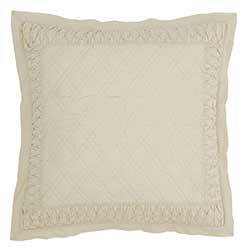 Adelia Creme Quilted Euro Sham, by VHC Brands. A hand-pleated border complements the intricate diamond-pattern hand quilting covering the Adelia Euro, with a flat double-sided flange on all sides completing the look. 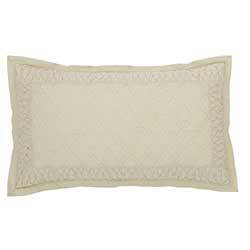 Adelia Creme Quilted Standard Sham, by VHC Brands. An elegant hand-pleated border surrounds the diamond-quilting detail in the center of the Adelia Creme Standard Sham. Flat flange on all sides completes the decorator look. Adelia Creme Twin Bed Skirt, by VHC Brands. Dress up your bed with our elegantly hand-pleated Adelia Skirt. Made of soft 100% cotton.